Is it just me, or has this week been particularly trying? First, To Shantarella who did the Safari Half in South Africa on Tuesday, and ran her best time ever! Erika, fresh off Ragnar, is running the OC Half Marathon on Sunday! Good luck, and run fast! Jack has been planning on running the Great Western Half Marathon on Sunday. I’m not sure if he still will, but if so, I hope he get’s his PR! Hyedi is competing in a triathlon on Sunday, and I hope she beats the 12-year-old in her wave (because getting beat by a 12-year-old is a little ego deflating). And…to Whitney! Good luck running your 10-K in my neck of the woods! I LOVE celebrating holidays, especially the slightly less conventional ones. Tomorrow is a doozy. Both Cinco de Mayo AND The Kentucky Derby are tomorrow. 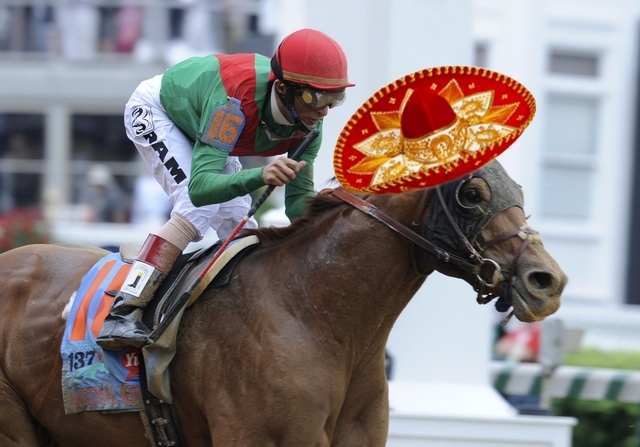 It has been declared Cinco de Derby. It will be a day of sombreros, margaritas, horse races, mint juleps, big hats, and mariachi music. Ideally these two celebrations would fall on different days, because that sounds like a lot to handle for a Saturday that will also include packet pickup and the usual house cleaning. But I am determined! I still need to choose my horse for this season. I usually choose based on the names. The weirder the horse name, the more likely I am to put money on it. So, I have a half marathon on Sunday. The half marathon two weeks ago made me realize that I need to change-up my approach if I want to not hate life and give up at mile 10. 1) I will start out with an 8:15 pace. This freaks me out because I’ve never started out that slow, and I think that means that I will have to start further back in the corral than I want in order to avoid having the speedy people run over me and my 8:15 pace. I’m going to try for negative splits, so we’ll see how that goes. I’ve never tried a formal approach to this. 2) I’m going to try running the first 5-K BEFORE turning on my music. I never train with music, but I always race with it. Apparently the motivational effect of music wears off pretty fast, so I’m going to run my designated slowest miles without it. Hopefully delaying music will give me the motivation when I’m needing it. 3) I’m going to switch to Clif Shots. I’ve used GU for the last few races I’ve done, but I’ve been training with Clif Shots for the last month. I have no idea if there is such a big difference between the two, but Chicago provides Clif Shots, so I’m trying to get more used to them since now. Since this is the last half before the great marathon training begins (and probably my last until September), I’m going to use this race as an experiment on shaking things up. By the time I get to September, I want to be running a 1:35 half marathon (yeah, I’m a little doubtful too), so I need to get my act together and figure out how I perform best now because I have a long way to go. Any weird tricks or switch ups that you noticed helped you perform better? I hope to have good things to report back on Monday. Until then, MAY THE FORTH BE WITH YOU! (If you just said, “and also with you!” in your head like I just did, then you get double cool points). LOL thanks for the shout-out — and boo to 12-year-olds. Good luck to the rest of you racing this weekend! I think things that have so far helped me perform better are starting to use some form of energy chews/gels and trying for negative splits.. so I think your game plan for the half sounds awesome — GOOD LUCK! Thank you! I don’t know why I feel such competitiveness toward the younger race participants. I will pretty much go to any length to not let a kid beat me! Hahaha! Thank you! I’m picturing a cross between Sean Connery and Peter Jennings…if they had female voices. I achieved a negative split in a marathon once and I’m pretty sure it will never happen again. It would definitely not happen at an 8:15 pace! Good luck in your half and thanks for checking out my blog! I am not all that confident in my ability to do it this weekend, and in a full marathon, I can’t imagine getting staying anywhere near 8:15 for extended periods of time! Maybe as a sprint to the finish line? Thank YOU for stopping by mine! Thanks so much for mentioning me in your blog. Its the first time anyone had so it made me smile. Glad I made you smile, and thank you! Thanks for the shout-out! And GOOD LUCK to you! You will do awesome. I can’t wait to hear how it goes! Me too! I think I’m going for the Bodemeister. Not the craziest name, but I just like saying “meister.” Good luck tomorrow! You know I have wondered the same thing, I always start too fast, but the way I see is I’m going to slow down at the end anyway so I better make up at the beginning… Hubby does great with the negative splits, so I am very curious to see how it goes for you, my next race is just a 10K but I might be trying it out. Good luck! Exactly! A slower mile is a slower mile whether at the beginning or the end. I’m going to have a hard time switching my thinking tomorrow, but maybe it will work out? The phrase is now “and with your spirit.” *sigh. I know. They ruined our Catholic Star Wars nerdiness. Hope you had a good race! You have great race strategy… starting out slower than you think you should has always paid off for me, but it can be hard to implement. And I think skipping music at the start is good too so you can really focus on your body and how you’re feeling. You’ve got great goals.. the determination will get you there! Thanks! It was much harder than I thought to achieve negative splits (I kind of failed at it), and starting off slow when everyone starts out fast took a lot of effort. But delaying music really worked well. I’ll just have to get more practice!